Bad Boy has produced a ton of Vale Tudo gear and walkout shirts for MMA fighters such as Mauricio Shogun Rua, and have innovated a lot of MMA training gear over the years. Show your support for the classic brand with the Bad Boy Classic Eyes Shirt, which is pretty damn low-key and doesn’t even have the Bad Boy logo in text, just the classic “eyes” logo that has been a worldwide icon. So if you’ve ever wanted to sport a Bad Boy shirt without the actual words on it then here’s your chance. 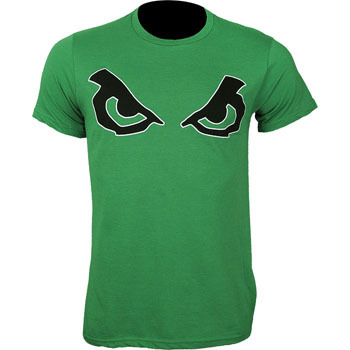 The Bad Boy Classic Eyes Shirt is available in 4 colorways: green, blue, red and black. The Bad Boy Classic Eyes Shirt is exclusively available at MMA Warehouse.